AllOver Media is a market leader in the Out-Of-Home media industry, supporting national, regional, and local media partners. With no IT department and no data warehouse, the team had to go from department to department, gathering data extracts from various third party systems like Salesforce, importing these into Excel and then generating reports. Unsurprisingly, this inefficient system led to stale, error-prone reports that were difficult to generate. BI Director, Nicole Sprandel, was tasked with finding a better solution. Nicole came from a business, rather than a technical, background: she has come into BI by way of developing all of the company’s KPIs. While she was a power user of Excel and understood how data insights could drive the business forward, she was not an IT professional, and the team needed a solution that was suitable for business users, without having to take on new IT staff. What’s more, Nicole was having trouble getting accurate, timely data from AllOver Media’s custom data sources. These include an MS SQL Server, SFDC, a general ledger database, Google Analytics, and a marketing database. While the team did have a BI solution in place, it didn’t give her the flexibility, control, or functionality she needed to produce the best results. None of the systems connected to each other and the company’s limited IT resources compounded the problem. On top of this, data was one-dimensional. Once disconnected from its original source, it went stale rapidly. For Nicole, connecting these disparate data sources in real-time, and creating complex data models to feed an intuitive, easily deployed interface, was a must. Nicole looked at a half dozen solutions. All but one required some form of data warehouse to report against: a no-go for her IT-light setup. The exception? Sisense. The Sisense Elasticube connects directly to virtually any data source, eliminating the need for additional, enterprise-level data warehousing. In a matter of hours, Nicole had Sisense installed, running, and reporting. Within a few weeks the entire system was set up, transitioning the 100 or so KPI reports developed in the prior year into Sisense dashboards. Stakeholders at AllOver Media found that, by leveraging their intimate understanding of the data, full control over the process, and use of the advanced filtering functions in Sisense, they could reduce the number of dashboards needed by a factor of 10. High-level customer support and manageable costs sealed the deal: Nicole chose Sisense as their new BI platform. 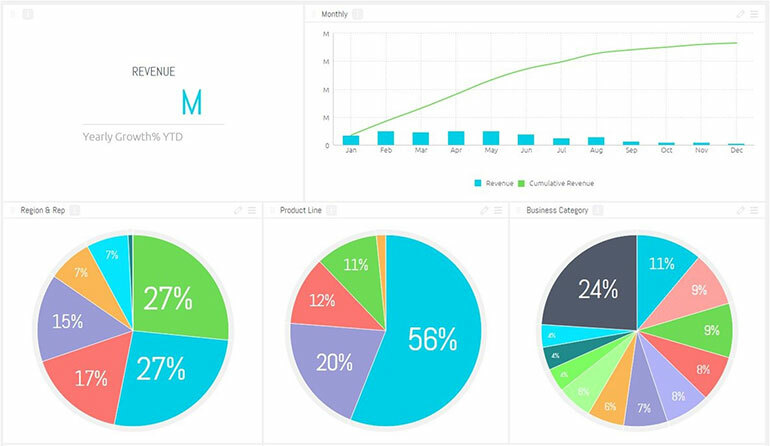 Sisense has allowed us to create top-notch visualizations for our business, with only the infrastructure that we need. The initial reaction to Sisense at AllOver Media ranged from wildly enthusiastic to cautious; past problems with inconsistencies in other reporting tools meant some needed more convincing than others. After hearing consistent praise from other users, though, and testing the results themselves, even those who had been hesitant soon became ardent supporters. The inventory offering from AllOver Media changes from minute to minute. Now that Sisense allows access to source data in real time, they can add the much-needed “time” dimension to their analyses. Sales and Accounting managers can also look at different slices of data, including media type, agency, and timeline, to see quickly if a rep might be out of line with a particular vertical, or if there’s an opportunity to build up a weaker channel. The team have incorporated this fresh ability to steer sales reps strategically towards the best opportunities into their growth plans. Executive and middle management teams are more efficient than ever, too. They are able to go through their data in real-time, posing questions and getting answers that allow them to make faster, smarter decisions. Nicole took a slow, difficult, static process and turned it into a real-time analysis engine with significant impact on the bottom line. She’s currently building sales performance dashboards that compare actual vs. target data for sales and is adding additional data sources into Sisense. AllOver Media’s BI team has scaled up users, reports, and adoption rates with minimal effort, creating custom views for key groups while still using a single source of truth. Internal adoption at AllOver Media has been enthusiastic and significant, all spearheaded by Nicole without a dedicated IT staff.